Angelic wings of Deth bring heavy metal salvation. 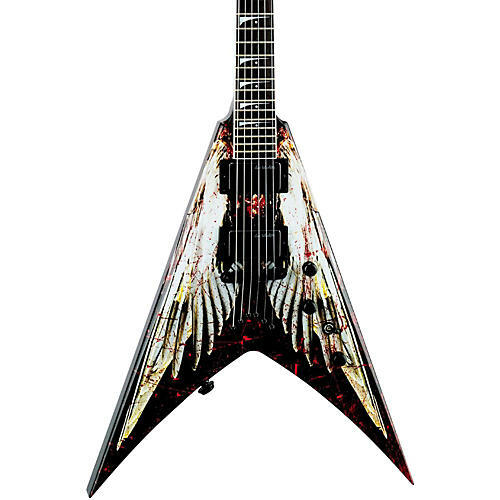 The beveled mahogany body has a custom blood-spattered "Angel of Deth" graphic for a Mustaine-inspired mix of the hellacious and holy. The special D-shaped set mahogany neck has Dave raving that it may be his favorite neck ever, with a 25.5" scale ebony fingerboard and dot/sharktooth combo inlays. This axe of darkness comes loaded with screaming Dave Mustaine Live Wire USA active humbuckers, TonePros bridge, Grover tuners, and Dunlop flush-mount straplocks for ultimate onstage performance. Black hardware.